This is exciting. I wish I had seen the original sale notice, though I likely would’ve made myself a pauper trying to find $700 to buy it. Where did you see it for sale? This book has proved harder to find than any other save for the first edition of ‘Keris and Other Malay Weapons,’ which was limited to 150 copies and mostly spread around South Asia right before World War II and post-colonial governments shuffled everything. 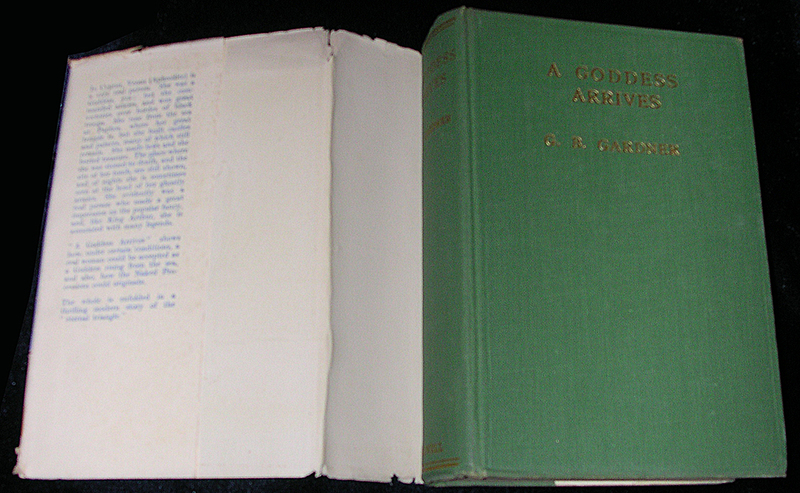 I have some theories as to why ‘A Goddess Arrives’ is so scarce. Philip Heselton — who I think examined a first edition from Clive Harper — found that the publisher (Arthur H. Stockwell ltd.) was bombed during the blitz. He provides evidence that the book was published around December of 1939, and the sustained bombing of London started the following September. I have no idea how quickly Stockwell would have moved stock of the book during that late winter, but it seems possible that many copies from that printing would have been destroyed. Heselton suspects that Gardner paid for the cost of publication himself (similar to how people do with ‘vanity presses’ today), which may mean that there were just few copies produced. I am not so sure that is the case. Gardner did not seem to have lots of copies on hand to give away to his friends, as he did with ‘High Magic’s Aid,’ which he funded with Michael Houghton. Certainly, ‘A Goddess Arrives’ doesn’t show up in photographs or autographed in rare book catalogs, as ‘High Magic’s Aid’ does. To give you some idea of this book’s rarity, these photographs make only the third privately-owned copy that I know currently exist (one of which was Gardner’s own). A copy was not included in the catalog of material that Ripley’s purchased when the museum was liquidated in 1973 (nor was there a copy of ‘High Magic’s Aid’). I assume that Gavin and Yvonne Frost must have gotten a copy to reproduce under their Godolphin House imprint in the ‘90s, and I suspect that Mandrake Press/Mandragora got hold of one for the IHO copy too. Of the six library copies in Worldcat, the three in the US are almost certainly reprints. It seems possible, though perhaps a stretch, that the only copies out there are the ones Stockwell sent out in advance to reviewers, national libraries, and Gerald himself. Oh wow, that’s fascinating. I found this copy last July on Amazon’s UK site of all places. The dealer was Chalice books, it sold within a couple days of my inquiry. They didn’t know much about the history, only saying there was a stamp from The Aquarian Book Service on one of the inside pages. I kind of wish I had rallied my resources a little more vigorously now. Probably the Aquarian Book Service in London run by Francis Clive-Ross, who also published the 1959 edition of ‘The Meaning of Witchcraft’ under the Aquarian Press imprint. How and when Clive-Ross got hold of copies would be interesting to know. I don’t know if any of you would be interested, but I have a copy of the book — the original hardcover, dust jacket and all. I’m looking to sell it. It’s in very good condition, as good as the one pictured if not a bit better. Please contact me at AngelaDenk@outlook.com if interested. I want it to go to a good home where it will be appreciated for what it is. Can you please tell me if this book was originally writen by Gerald Gardner or not? I heard Gerald Gardner wrote only three books through his lifetime, there are: hight magic aid, witchcraft today and the meaning of witchcraft. 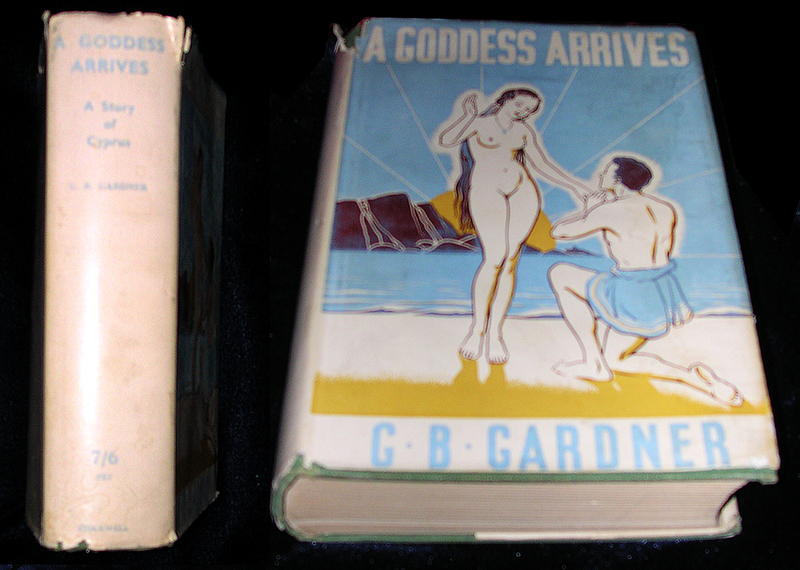 But no one knows about this book “a goddess arrives” if you can tell me anything else about this book, I’ll appreciate your help. This book was written by Gerald Gardner. He wrote 4 books, not 3. This book was his first, written in 1939. Do you know if this book, talks about wicca, I mean the religion, or it’s a kind of novel or so? Please, I need more information about this book, until know I did not know anything bout this book. This book may have some themes that show up in Gardner’s later works, but does not relate directly to Wicca. It mainly explores the concept of reincarnation and delves into Gardner’s spiritual leanings at that time. Thank you very much for your information and your time. It was great sharing information with you.